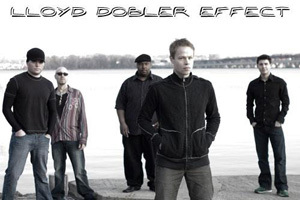 Drawing from the diverse Washington DC music scene, the Lloyd Dobler Effect fuses popular rock with percussive rhythms and vocal harmonies to create an intricate and fresh sound. LDEs multi-layered, upbeat, and danceable music showcases their universal, appeal to both mainstream modern rock lovers and culturally diverse audiences. LDE has opened for several National Recording Artists including EMINEM, THE GOO GOO DOLLS, GOOD CHARLOTTE, THE ROOTS, AUDIOSLAVE, THE FRAY and JACK JOHNSON (to name a few). LDE has performed at over 170 college campuses and showcased at four college conferences (NACA and APCA) in the past two years. An energetic, young band, all in their early twenties, LDE has earned a loyal following both internationally and throughout the United States. LDE's fans enjoy the memorable songwriting, thought-provoking lyrics, and exceptional musicianship that anchor the groups high-energy live performances. LDE has performed in 39 states and 8 countries. LDE performs over 250 gigs a year and is always eager to meet and greet fans as well as donate their time to charitable orginazations (their favorite being SPECIAL LOVE INCORPORATED, which provides leisure activities for children suffering with cancer).